The idea of tranship, or trans-ship, and trans-shipping, is to get the corals from the exporter to a client across the country as fast as can be done. The duration is great enough that the corals or fish must be re-acclimated and re-packed in L.A., which is commonly just called "re-ox." We do a pH-controlled re-acclimation, with everything getting new bags, water, and ox. This allows you to get corals directly from the exporter just like the wholesaler or retailer, rather than after much has been cherry-picked at each stop on the way. 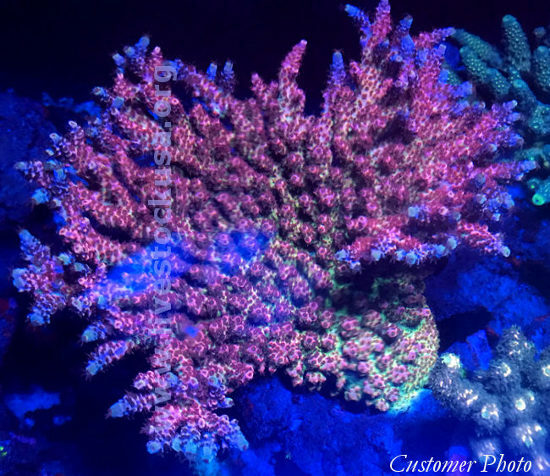 Some corals might look differently when they come in from tranship than how you usually see them in the store. The corals are packed nearly 24 hours by time they arrive in L.A., and then another 18-24 from L.A. to you. By the time you get them they have been in the dark for most of nearly two days, in full-blown, inside a box, blackness. Some corals may temporarily lose some color from the experience. When they arrive, some will still look great in the bag; some will look okay; some might not be so impressive. At the two days in a bag point, most things are in full regression. Mushrooms are a tenth of their expanded size or less, zoos and star polyps are closed so tight it might take a day or two to open. Softies and LPS often do pretty well in shipping other than fully contracting, often beyond anything you have seen or thought possible. Usually over the first night they blow up, rehydrate, and double or more in size. A little leather when you went to bed is a large one in the morning. SPS sometimes suffer a fading of color; some will not, but some do. Generally there will still always be traces of the neon blue, pink, or green, or yellow, etc. You will be able to tell they are good quality Acros from the colors right out of the bag. Although some are likely to be only a hint of what they really are, others will be mind-blowing awesome. Usually the ones that seem least impressive at first, turn out to be the best ones. With a couple weeks to 30 days of TLC they will be at their former pre-shipping glory. We want to share with you a perfect example of this. Francisco M. of Miami sent us this picture showing a mixed box of Kupang tranship he received from us. Note the pale, creamy Stylophora, just a little pink, not particularly impressive of color the day after arrival in quarantine, though the size and shape are clearly excellent. There is admittedly only a hint of color on it. Except I know better. Look at the same coral one month later in the "after" picture when it graduated from quarantine to display tank. It is somewhere beyond spectacular and astounding. It is the same piece. Many of the polyps are neon purple in close-up. It is hard to imagine such when you were dreaming of getting something like that, and see the creamy coral when you open the bag. There was really no indication of that upon arrival, as is often the case. Our suppliers are the cream of the crop, we don't do brown unless you special order it, the pieces are almost always the real deal A-1 5-star, sometimes even when they don&apos;t look it upon arrival. To be honest, some customers have complained about some pieces not being colorful enough out of the bag, and plain, upon arrival. This is the difference between a coral in a retail store for a month, and one out of the bag just in directly from the exporter after 48 hours in the dark. Often an outstanding piece of stunning beauty might not appear so obviously right out of the bag after two days in the dark. And such is the case often with a couple or a few corals in a box, depending on what you order. Obviously, Francisco knows what he is doing and took great care of this piece during quarantine, and we appreciate him sending us the picture of it graduating to the display tank! Great work F.M.! We wanted to share it with everyone because it shows so well something normal to expect when ordering direct from exporters, tranship. These before and after pictures do say ten thousand words. 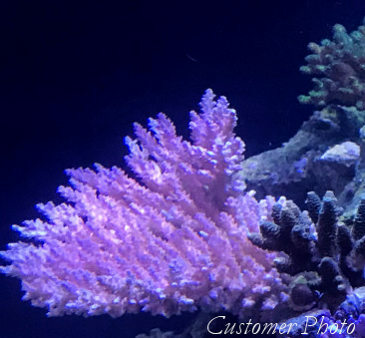 Here is a before and after photo of a Fiji Acropora. The first image (on the left) is from when it was first received. A nice pink Acro, seemingly nothing extraordinary. The larger photo is after six months or so ... note the blue tips on the new growth. I can just about guaranty it had those blue tips when it was collected. But over the couple of weeks of acclimation to tank life, and then going through shipping, it has lost the color from the fresh recent newest growth areas. In a few months with proper care, a rather large percentage of single color Acros &apos;out of the box&apos; will respond the same way. So to a degree, especially with Acros, even when you open the box, what you see is not what you will end up with. Usually they get much much better than at first light after a couple of rough days in the dark. Most will reacquire their full original colors. They still have some of that dna in there. Often as not, that green Acro will end up with some other color on the tips or polyps. A good supplement (trace elements) regimen is very important, fast growing Acropora can really eat it up.